Marilyn SanClemente August 16, 2016 August 16, 2016 All Occasion Card, All Occasion cards, General, Global Design Team, Stampin' Up! 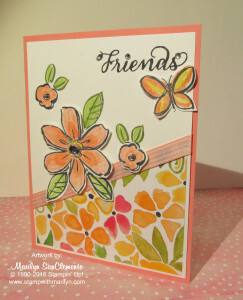 Today I am sharing a handmade card made with the Garden in Bloom stamp set from Stampin’ Up!. This card was inspired by the color challenge from the Global Design Team for this week. What a pretty color combination! 1. 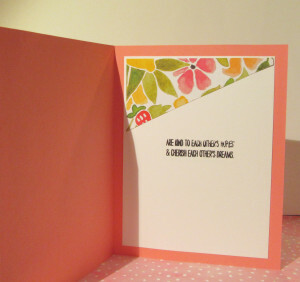 The card base is Flirty Flamingo cut to 8 1/2″ x 5 1/2″ scored at 4 1/4″. 3 3/4″ x 3″. I cut this piece at an angle. 1. I stamped the flowers with Black Momento ink on the piece of Whisper white towards the middle/top of the card since I am going to add the Designer paper to the card. 2. I stamped the large flower from the Garden in Bloom set with two leaves and the small flower that are partially covered by the Fruit Stand designer paper on a scrap of Whisper White cardstock. I also stamped a butterfly. Next cut all of these out of the Whisper White cardstock. 3. Now for the fun part – Coloring – I used a Blender Pen and my Flirty Flamingo, Daffodil Delight and Pear Pizazz ink pads to color the flowers and leaves. Tip for coloring with Blender Pens: Before you open your ink pad press down on the lid which will make a puddle of ink on the lid. You can use the puddle of ink to pick up the color that you are coloring! When you are finished with a color and ready to move onto the next color just scribble onto some scrap paper until the blender pen runs clear. The Blender Pen tips will get stained with color but as long as it runs clear you are ready to start with another color. 4. Attach the Fruit Stand Deisgner paper to the front of the card. I added a piece of ribbon over the seam of the DSP and White cardstock. Then attach the flowers that you have cut out with dimensionals. 5. 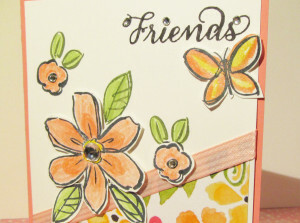 Next I colored just the word “Friends” from the sentiment with a black marker and stamped that on top of the card. 6. And of course you can’t forget the bling!! I used Rhinestone Jewels on the center of the flowers. And then I colored each of the flowers and the butterfly with the Clear Wink of Stella pen. I just love the way that pen adds sparkle to a card. Pictures just don’t do these colored items justice! 7. Last I added the triangle that I cut from the Designer paper to the top of the inside of the card. I colored the rest of the sentiment using my black marker and stamped this on the inside of the card. 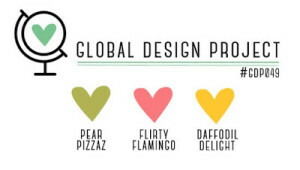 I have to say that I really like the Fruit Stand Designer paper even though I didn’t purchase the Fresh Fruit stamp set… I wish I could buy all the sets that I really like – but then where would I store them?? I like how the upper style and lower style of card demonstrated the colors! Superb! So pretty! Great use of DSP too, which I also forget to try! Thanks for sharing your lovely card at Global Design Project this week.